Black Hill television transmitter was first opened in 1957 but the first mast was replaced by a higher structure in 1961, the original was moved to Selkirk and is still in use. The mast is 307m high, see How High is High ? Edinburgh ! ). Most people in Glasgow, Coatbridge, East Kilbride, Motherwell and Paisley receive their transmissions from Black Hill, but there are those in Stirling and even in Edinburgh who also use Black Hill (rather than Edinburgh`s more usual transmitter Craigkelly) if the local terrain or other buildings mean the line of sight is better. For Black Hill we recommend the DM log for strong signal areas, the Log36 or Yagi 18K for medium signal areas, the Yagi18B for outdoor installs in poor signal areas,the XB10B for loft installations in poor signal areas, and the XB16B for those with the most marginal signals. Unless you have a massive loft we`d normally recommend an XB10B for loft installs (over an XB16) due to smaller size of the former aerial. The dimensions and test performance of the aerials can be found on the relevant tables. Those in poor reception areas, can take advantage of the superior performance of a B group aerial over a wideband. If you really need a “high gain” aerial (and most people don`t) a decent B group aerial should be used, see below. On the other hand if the signal is strong (or medium) then, by definition, it doesn`t need a “high gain” antenna anyway ! Under these circumstances a Log Periodic should be fitted instead. Black Hill is horizontally polarised. It was originally a B group for analogue, then temporarily became an E group (or wideband) whilst transmitting both analogue and digital, before reverting back to a B group at switchover in 2011. 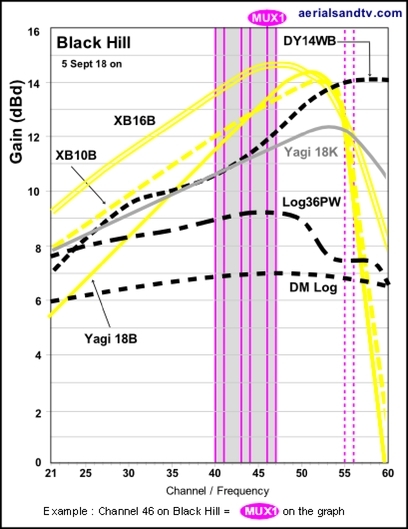 It should be noted that wideband or E group aerials which worked before the June 2011 switchover should continue to work after that date as well. 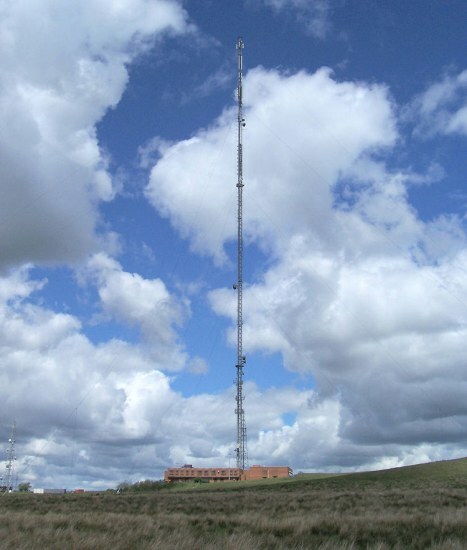 Black Hill is a main transmitter and it has sixty four (including Torosay`s twenty two) smaller relays (or repeaters) to improve coverage in poor reception areas within its coverage area. There is one ”Local” channel allocated to Black Hill, CH51, this is mainly used for a local Glasgow TV channel. 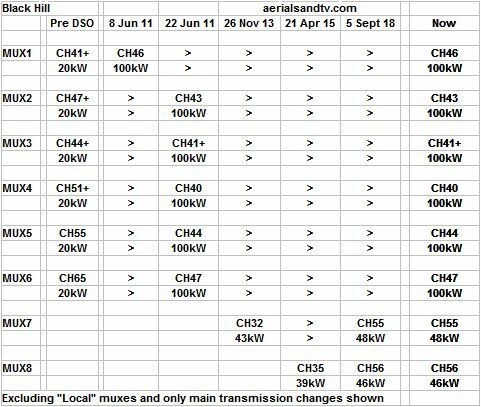 In addition, there are two lower power HD MUXES on CH32 and CH35. 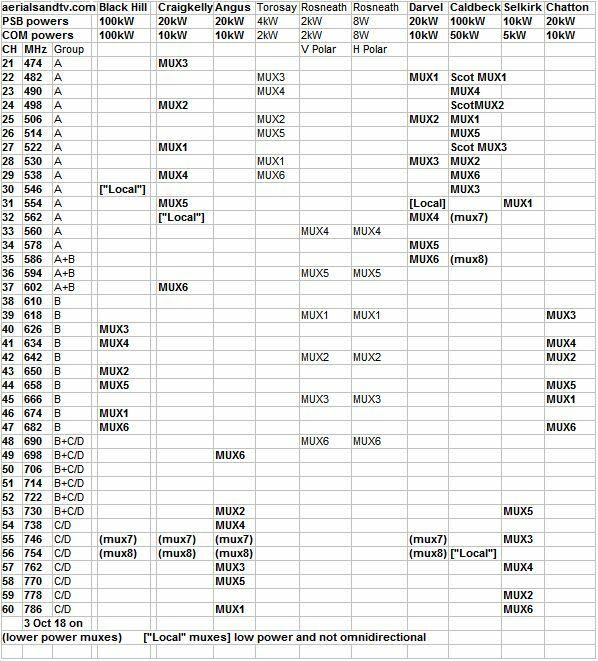 All of these possible channels can be picked up by decent B group aerials. The guide below also includes the same information for other potentially co-receivable transmitters within Black Hills coverage area, namely Craigkelly, Angus, Torosay, Rosneath, Darvel, Caldbeck, Selkirk, and Chatton. The Channel Allocation Guides can be very useful in the diagnosis of co-channel interference problems and can also be invaluable if you are trying to find a spare channel for a modulated output (e.g. for a Sky box or CCTV system) to be added to your TV setup/distribution system without suffering from co-channel. Also check Black Hill`s sixty four (including Torosay`s twenty two) smaller relays. I suspect that Caldbeck may well have a restricted radiation pattern in a Northerly direction and that “Caldbeck Scotland” will act as a supplementary transmitter (on different frequencies) only transmitting in this direction.